Didn't find what you wanted in our standard plans? Not a problem. 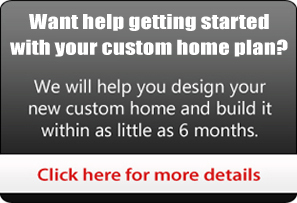 We make designing your own custom home simple and cost free. We will help you achieve a design that works for you, and provide an estimate to build your design, all without deposits, contracts and expensive architectural fees. Have the comfort in knowing you can get what you want at a price you can afford without being over-committed. In these changing times, a family's need for quality affordable homes have become a priority. The practical home is once again becoming the focus. Affordable custom homes and quality is becoming trendier than "how big of a home can we afford". More people are back to thinking of long term livability, affordability and to customize homes to the tastes and needs of our families and lifestyles. While it is true that square footage can sometimes dictate your appraisal outcome, bigger is not always better. Choosing a home design and floor plan with the functionality that meets your needs and getting the most quality for the money are the most important considerations. You must decide what is important to you? Do you need an open flowing floor plan to accommodate gatherings of family, friends, co-workers or to host parties? Do you have a specific piece of land with wonderful backyard views which would be perfect with a rear great room and lots of windows? Do you have plans for a growing family where a bonus room or future living space can help keep the costs down for now yet let you expand when you need to without breaking the bank? There are many things to consider. The great news is that in building a custom home, you can get the home the way you want it. The way you need it. Now, all you have to do is decide where to start. We're happy to tell you that it will not be that difficult. There are a few simple ways we can help you get to what you want. You may already have a full set of drawings, or a collection of floor plans, elevations and renderings that you just need us to evaluate. Whatever you bring to us we have the resources necessary to get you a design and full quote. We want you to feel stress free during the homebuilding process and know we will listen to your needs and wants in the design stages. We will help you take all of your wants, needs and property considerations into account while helping you create the design that is right for you and your budget.Building your dreams need not be stressful, but exciting and satisfying. So, contact us today to help you get started.